The UEFA Super Cup is a match organised by UEFA. It is played every year. The winner of the UEFA Champions League plays against the winner of the UEFA Europa League. It is played in the middle of August. The UEFA Super Cup started in 1972, with the winner of the Champions Cup playing against the winner of the European Cup Winners' Cup. It was not recognized by UEFA because it had a team that was banned from UEFA competitions, Rangers F.C.. Since there was no stadium chosen to host the game, they played one match at one team's stadium, and one match at the other's. In 1973, the first Super Cup final to be recognized by UEFA was played between Ajax and Milan. On aggregate (the added score from the 2 matches), Ajax won 6-1. In 1991, the UEFA Super Cup between Manchester United and Red Star Belgrade was only played at Old Trafford (Manchester United's stadium) because of the war in Yugoslavia. In 1992, the Champions Cup was renamed the UEFA Champions League. In 1995, the European Cup Winners' Cup was renamed the UEFA Cup Winners' Cup. The tournament was made the same. In 1998, the tournament was made 1 match with a host stadium. In 1999, The Cup Winners' Cup was ended by UEFA. The last Super Cup to be played with the winner of the Cup Winners' Cup was between Manchester United, winners of the Champions League, and Lazio, the winners of the last ever Cup Winners' Cup. Lazio won 1-0. In the year 2000, the Cup Winners' Cup was replaced in the Super Cup by the UEFA Cup. The first match to be played this way was between Real Madrid, the winners of the Champions League, and Galatasaray S.K., winners of the UEFA Cup. Galatasaray won 2-1. 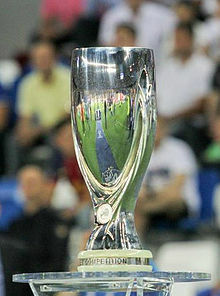 In 2009, the UEFA Cup was renamed the UEFA Europa League. The tournament stayed the same. The trophy being presented before the UEFA Super Cup final in 2015. The UEFA Super Cup trophy is with UEFA at all times. A replica trophy is given to the winning club. Forty gold medals are given to the winning club and forty silver medals to the runners-up. A. ^ The 1972 final is not recognised by UEFA as an official title. ↑ "Wembley, Amsterdam ArenA, Prague get 2013 finals". UEFA.org. 16 June 2011. ↑ "UEFA EURO 2020, UEFA Super Cup decisions". UEFA.org. 30 June 2012. ↑ "Georgia's Dinamo Arena embraces UEFA Super Cup 2015". Agenda.ge. 5 March 2014. ↑ "Milan to host 2016 UEFA Champions League final". UEFA.org. 18 September 2014. ↑ "FYR Macedonia to host 2017 UEFA Super Cup". UEFA.com. 30 June 2015. ↑ "Regulations of the UEFA Super Cup 2015-18 Cycle" (PDF). UEFA. March 2015. Retrieved 12 August 2015. This page was last changed on 20 May 2018, at 04:37.